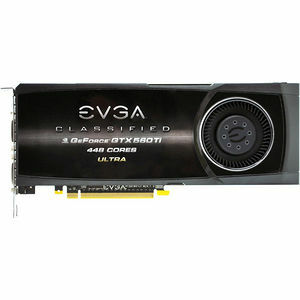 Introducing the latest in high performance graphics accelerators, the EVGA GeForce GTX 560 Ti 448 Cores. EVGA has boosted this card to 448 Processing Cores, upgraded the memory to 1.2GB and added full support for NVIDIA 3-Way SLI, making an excellent card even better. This new card from EVGA offers better performance, better features and a better warranty than competitors!